During my pregnancy, I had complications with my son however I was extremely happy to see that he managed to be born full term and looking healthy. When it came time to breastfeed him however, I knew that there was something wrong. He was not as satisfied after feeding unlike my older child. He also had rashes on his body and face. At 4 months, we then took him to see the paediatrician and that confirmed my belief. The skin prick tests confirmed that my son is allergic to gluten and wheat, dairy, eggs, all nuts, soy, crustaceans, plus some fruits and vegetables such as avocado, carrots and a few others on the list too. There were so many allergies on that list, I didn’t know what to do. My life has changed since that day. I had to become very careful with my diet and make sure that those allergens were not in my food while I was breastfeeding him. I have to admit that it was not easy to avoid those allergens since they are in most of my favourite foods. However, my effort had paid off. My son’s skin thankfully cleared up. The next challenge was when we started him on solid food. I wanted my child to love his food, but I also wanted to make sure that the alternatives I found didn’t give my son an allergic reaction. I started looking for food ingredients everywhere – both offline and online, inside and outside of Australia. I still remember that smile when he had his first bite of rice bread, rice pasta, crackers, and he would want to eat that new food every meal. It was the greatest feeling in the world for me. Before having my son, I worked in a financial services company. After maternity leave, I went back to work and sent my two sons to family daycare. One day I have got a call from the carer and my youngest son came home with very swollen eyes. Even though he was still smiling, it really broke my heart. For me, I could not bear to see this happen again. Just one wrong ingredient in something he ate could do this again. It would always take a lot of effort and was difficult to find something that didn’t contain ingredients that he was allergic to. I realised that there must be other mums out there in the same position as me. I wanted to help make a difference. So, I quit my job and became a full time mum while starting my own business www.greit.com.au * inspired by my son’s gluten free and allergy friendly diet. It is my hope that it helps other mums that are in my position too. * If you have a baby or child with suspected food allergy, please ensure that you consult with your paediatrician and dietitian first. 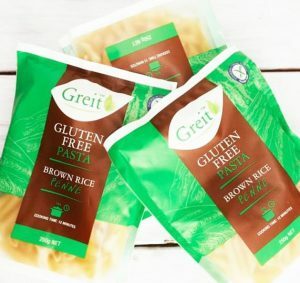 Greit will be exhibiting at the NSW Gluten Free Expo this year at Booth 64 (in front of cafe area) with yummy rice pasta samplings and special promotions. When: Friday 26 August 12 noon – 7pm and Saturday 27 August 9am – 4pm. 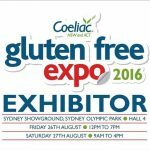 Venue: Hall 4 Sydney Showground, Olympic Park. #Content in this article has been by contributed by Jee Sirinthip, edited by DearBub Blog and Magazine Staff. Please apply credit if referencing this article. Do you have information for our readers that you would like to share or contribute to DearBub Blog and Magazine? 1 Comment on "My Baby Had Food Allergies, I Didn’t Know What to Do"
I have had this brand of pasta a few times and it is so delicious. One of the best gluten free pastas that actually taste like pasta. I have two packs in my pantry. What a great job you’ve done! Thank you! 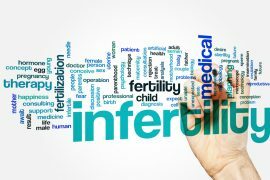 Next articleMy Miscarriage Made Me Stronger. This is How I Healed.